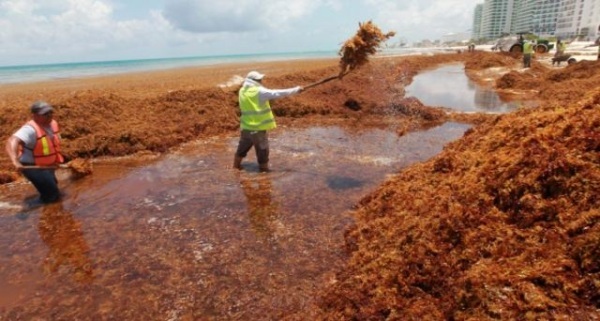 Puerto Plata.- The concern over the bunches of seaweed that washed ashore Cabarete beach prompted local business leaders with the support of the tourism authorities to conduct a cleanup operation. Last week numerous citizens had denounced the onslaught of Sargasso seaweed which prompted the Cabarete Business Association to conduct a cleanup of the beach. “When this type of situation occurs, it causes a considerable reduction in the visit of tourists to the beach of Cabarete, for which we call on all authorities and interested parties to join the cleanup work,” said Association director Carlos Atahualpa Paulino. To haul the tons of seaweed that floated onto Cabarete’s beaches away, a front end loader and two dump trucks were put to the task, helped by Tourism Ministry crews which raked the entire area.